If I had a bucket list, disagreeing with Anderson Cooper on national television would be on it. And I would be crossing it off! A few weeks ago, a man got pushed onto the tracks of a New York subway station. Someone managed to take the picture below, which wound up on the cover of the Post. You probably saw it. While I was super pleased to be on the show and enjoyed myself, I was frustrated that I did not get a chance to share a couple of important points, especially when I felt like we were all living in a fun little fantasy. While Cooper was right on some things, and the conversation was in many ways more substantive than I have come to expect from cable news, he is completely wrong about wider culture. It is ludicrous to think that emergency situations are some magical prism in which our true character is revealed. Keeping Your Head is a specific skill that is cultivated through practice. Most of us have little. Instead, we do what we are trained to do. The modern human, generally, is good at whipping out phones and taking pictures. We usually have no clue what to do in pressure situations. A couple reasons might be that our lives include sitting in cubicles and exclude panicked flight from saber-toothed tigers. But, when the modern human does have a clue (read soldiers, fireman, police officer, etc. ), we almost always act bravely. The idea of the banality of heroism debunks the myth of the “heroic elect,”…[which ascribes] very rare personal characteristics to people who do something special—to see them as superhuman, practically beyond comparison to the rest of us. But if incredible bravery is normal, why are we so blind to it? 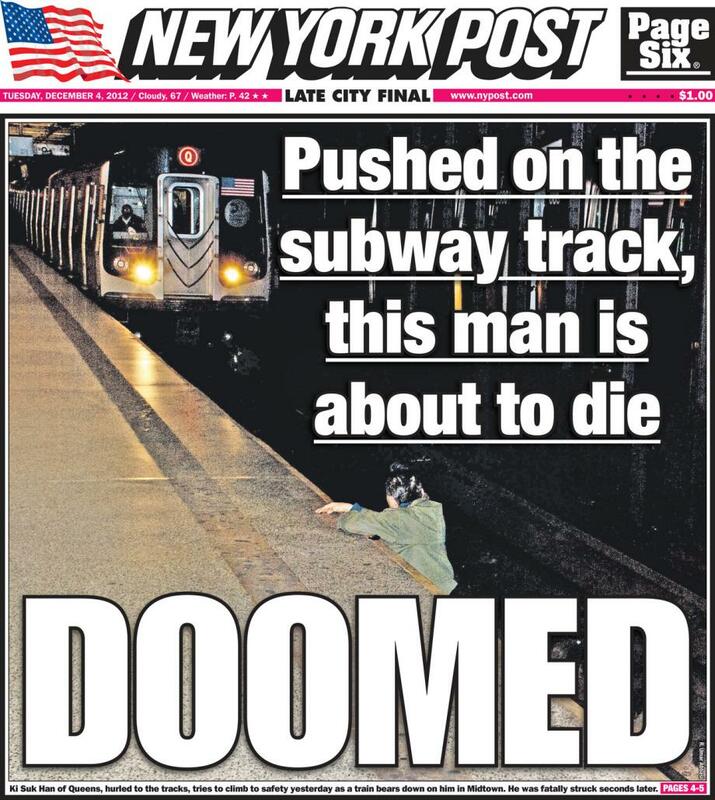 Why did the country roundly condemn the bystanders who let the man die on the subway tracks? Good question. I’ll blog about that next time, but I’ll say this much: What struck me as I listened to Anderson Cooper and Dr. Drew talk before I went on the air is that negative news and looking down on others seems to serve an important social function that I had been reading about in Jonathan Haidt’s The Happiness Hypothesis. Namely, gossiping about what’s wrong with other people helps us bond to the people that we gossip with. Oh…and here is a picture of Alicia and I at a little shin-dig that happened 20 blocks away from our house. Thank you Derek Schwabe for getting us tickets! I recently read a short story about pandas, watched 2 documentaries on pandas, and enjoyed Kung Fu Panda 1 and 2 . In my newfound expertise, have come to the conclusion that pandas are entirely pathetic creatures. First off, 99% of their diet is bamboo–delicious and not at all nutritious. 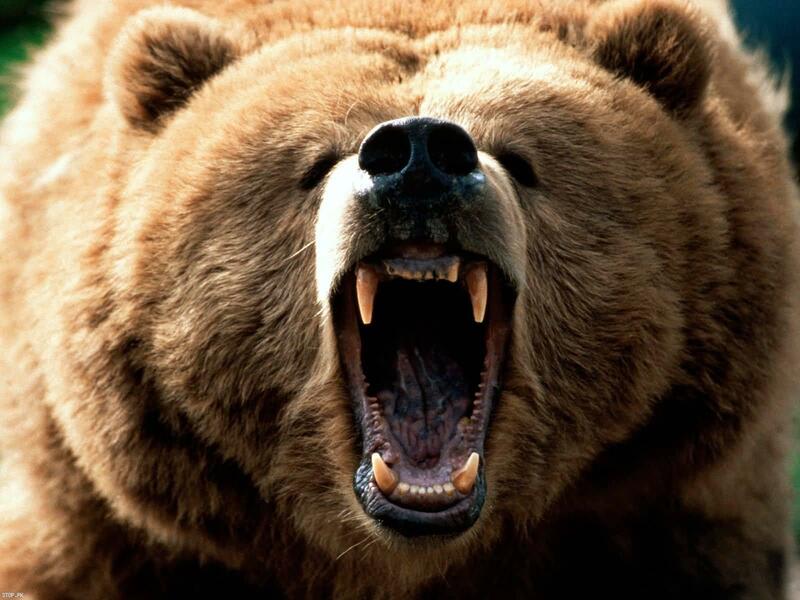 A true bear, they have carnivore specific genes, carnivore teeth, and a carnivore digestive system, so they derive even less energy and protein from their food. They can’t hibernate for the winter because there is no way for them to store up enough fat. They don’t like moving around much. And they avoid mountains because it takes too much energy to climb. Males weigh up to 350 lbs. Females up to 280. 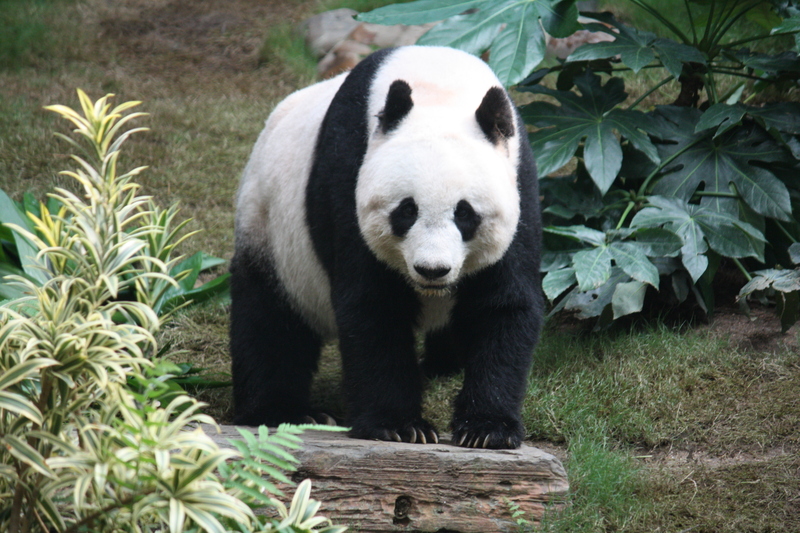 They eat 20-30 lbs of bamboo shoots a day and can poop, with all that good roughage, up to 40 times a day. The rest of the Panda’s diet, the 1%, is other grasses, wild tubers, small birds, rodents, or carrion. Pandas have very short life spans and sexually productive periods. They lose interest in mating once captured. Even in the wild they can’t raise more than one cub at a time–if more than one cub is born one is left to die–because their milk is so low in nutrition. And the cubs need nutrition. They start out pink, blind and furless, at a whopping 3.5-4.6 ounces. In contrast, black bears weigh around 300 lbs and will eat nearly anything. Polar bears eat almost nothing but meat and weigh up to 1500 lbs. 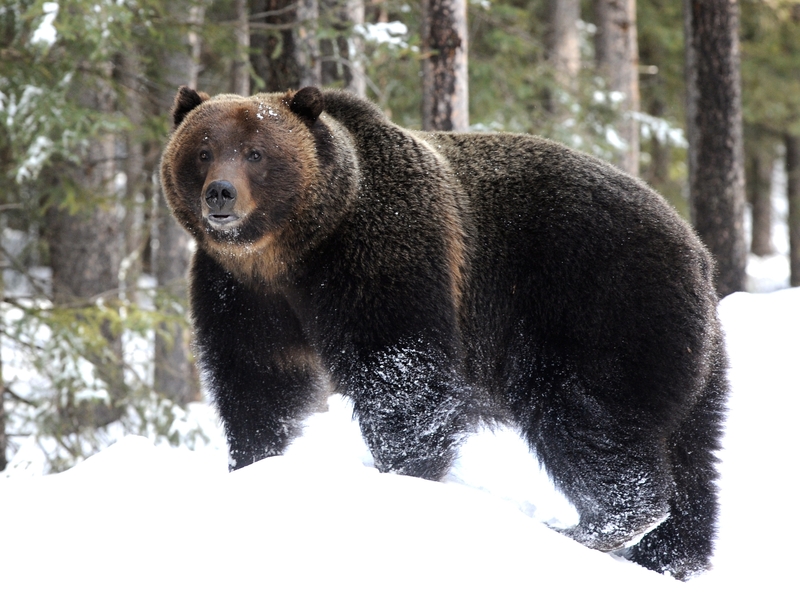 Grizzly bears also weigh up to 1500 lbs. When my brother was in ninth grade he told me something that has stuck with me. The best stories are those in which normal everyday people discover something about themselves, something special, some heritage, special skill, or destiny, that launches them into a life of adventure, excellence, and self-fulfillment. I guess I am waiting for the Giant Panda to remember it’s a kickass bear. Yup. Men and boys. Exactly. Good thing they did not include the rest of the interview, cause I go on to expound on how all women and girls are worthless cowards. No. That is not a true story. The host, Angelique Proctor, understood what I meant when she said, “Jeremy…believes any of us would have had a similar reaction.” So why did I say “men and boys”? Obviously, cause I was a tad stupid. I cringe when I hear the line. Alicia cringed too while watching the interview from the other side of our living room. This was my first interview, and my worst. I was clueless. This experience makes me extremely patient with celebrities and politicians who get in trouble because of sound bites. I have been saying for years that if I was a celebrity I would get caught saying idiotic things all the time. And, in my fifteen minutes of fame, I proved myself prescient. Fortunately context saves me. Often it will not. I do, in fact, consistently say dumb things. But this time context saves me. At the beginning of the interview Angeligue had asked me why I grabbed the guy. In my answer, I talked, among other things, about how I had been an adventurous, daydreaming boy, who often imagined the day I would rescue damsels in distress on a semi-weekly basis. As I grew older and started lifting and working out, ostensibly for sports, I knew it was in fact secret superhero training. Though overstated, I think this rings true for many other boys who, like me, grow up to be men but never quite lost those specific daydreams. There are lots and lots of us out there. The “men and boys” comment was meant to bring this context to bear in order to support the broader point that there are many others who would have acted similarly. Some of these people would be, I think, the people who had developed the silly and noble psychosis that I had. So I was in fact making fun of men and boys a bit, and my comment was inclusive, not meant to exclude others from being brave, but to note that one of the groups that would be brave in these sorts of situations is a group I have already mentioned. Of course, none of this was clear from the interview. There are those who had concerns before the “men and boys” comment. I certainly hold beliefs and ideas that some find sexist-ish and I espouse them liberally (or conservatively?). I do not think they are sexist, and Alicia does not think they are sexist either, at least not usually. I plan on blogging about them and the reader can decide for his or her self. In the meantime, please accept my apologies if you were offended by my comment on Fox5. I assure you, in this case at least, I was not sexist, but merely dumb. Instead of people simply seeing this story on TV and saying, “Oh it’s nice that someone out there is brave,” I wish they would say, “it’s nice to see a reminder that we are a brave and caring people.” We are. You are. That’s the message that I wish the news coverage would talk about more. Stories of ordinary people being brave broadcasts that secret. I am the same philosophizing-goofball I was when I was waiting anxiously for the train. My ensuing actions say something about all of us, about average people. We rise to occasions. It would be absurd to think, for example, that the folks on flight 93, which crashed in PA on 9/11, who acted way braver than me, were by some fluke of travel planning in the top 1% of brave people in the country, or even the top 10% or 30%. Nah. They were most likely a swath of regular folks. This tells me that the average Joe can be counted on to be brave and is most likely capable of incredible human kindnesses. So what do we do with that? I think we should treat each other with the respect that brave people deserve and take some comfort from the fundamental decency that pervades our society–though too often in secret. Some disagree. They say I have to look no further than the people in the video just standing around and not helping. There were hundreds of people there just watching, they say. What about the guy who filmed it? What decent human being chooses to film instead of help? But what should they have done? What is helpful in that situation? Even in retrospect, in the calm of my living room, I have a hard time thinking up things they should have been doing. In the chaos of the moment, how can we expect people to have any clue what to do or even to know what is going on. People are always morally bound to do what they think is right, but if you have no idea what is right, you have no decision to make. Those of you who have read my manuscript know that if there is no decision to be made, then nothing can be revealed about a person’s character. If there is nothing you think you should do, it isn’t even possible to reveal how brave or cowardly you might be. 1) Most people who watched the event unfold came later. Right when it happened, there were only a few people near where he fell in. Of those people, I was the first to react, but there were reasons for that. 3) I ran up thinking that all it would take was jumping down and picking him up before the next train came. So, I became involved in the situation before I understood how dangerous it was. When somebody freezes in a pressure situation. It does not mean they are not brave. It means that they have no idea what to do. They still really want to help, and they think they should be helping, but they have no idea what to do. I only knew what to do, or had an opinion about what I should do, because of my experience. Ultimately, I think it is likely that not a single person at the incident knew exactly what they should do and yet failed to act out of fear and cowardice. If so, nobody there was cowardly at all, and the man who caught it on video did do some real good: the video-footage is proof for all of us that we are a brave and caring people. That video now has almost 60,000 views! Crazy. And my friend Andie just told me the front page of Yahoo News had it up for a while. The most accurate coverage though I think was done by CBS.